Recent release “The Time We Met” from Page Publishing author Barbara Theesfeld is a love story. Kit and Derrick meet in a fatefully crowded airport café, fall deeply in love, and suffer the agony of separation as Derrick loses his battle with heart disease. 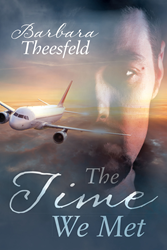 Barbara Theesfeld, a resident of St. Paul, Minnesota and flight attendant with a passion for writing, haunting bookstores, and attending the annual Renaissance festival, has completed her book “The Time We Met”: a searing, yet hopeful story of an eternal love that transcends time and space. Published by New York City-based Page Publishing, Barbara Theesfeld’s novel is a riveting study of love, death, and new life. Katherine “Kit” Grey loses the love of her life, and she starts to crumble uncontrollably under the weight of grief. Sadness and loneliness consumes her until someone unconventional appears and teaches her that love never dies but continues on. Readers who wish to experience this potent work can purchase “The Time We Met” at bookstores everywhere, or online at the Apple iTunes store, Amazon, Google Play, or Barnes and Noble.